Not so much a location as an event, the Appleby Horse Fair takes place over 4 days on the first weekend in June. The Appleby Horse Fair has taken place since at least the 12th Century and today attracts about 10,000 Travelers, along with many other visitors. 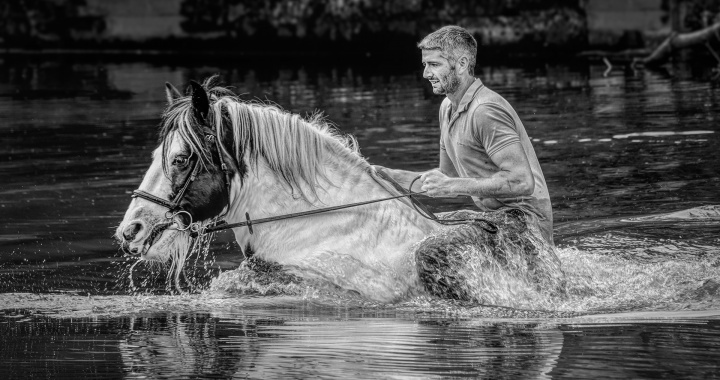 One of the main sights is the washing of horses in the River Eden, which was traditionally performed to prepare the horses for sale. This can be photographed from either side of the river or from the bridge, but the best location is probably on the east bank of the river as views from the west tend to have too much clutter in the background. The main Traveler camp site is located about 1.5 miles north of the river, and is reached along a narrow country lane. Many Travelers ride their horses and carts at high speed along the narrow road to show off their horsemanship. Care is obviously needed along this stretch of road, but it does give photo opportunities to catch the horses in action. There are numerous car parks around Appleby to cater for the large influx of visitors. On our visit, we parked in the grounds of Appleby Castle, which is the postcode given above. To view the washing of the horses, walk through the town centre and turn right onto Bridge Street which crosses the River Eden where the horses are washed. To reach the main camp, continue on the main road north before turning off on a minor road under the A66. There are continuous crowds of people and horses coming and going between the camp and the town centre, so it is difficult to go wrong! Posted in Cumbria and tagged Riverside, Event.